Home » Newsletter » Carbon Steel vs Stainless Steel Chef’s Knives – are you cooking or looking? Carbon Steel vs Stainless Steel Chef’s Knives – are you cooking or looking? 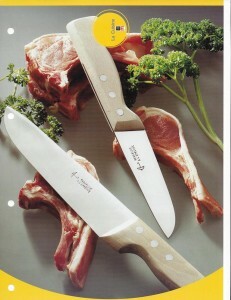 We recently discovered a set of knives we love…sharp…durable,,,big handles…and best of all inexpensive. Many of us remember the kitchen knives grandma used daily…not pretty but sharp as a razor…worn from years of hard use and multiple re-sharpening. But, they still outperformed the newer stainless steel knives for edge sharpness and holding. So we went on a search for “old fashioned” carbon steel knives, understanding that good looks were not the objective. Another issue presented itself. A broken hand suffered in a fall a few years ago had not regained it’s ability to grip the small handles typical of the prestigious products of Solingen. Our search included finding a handle design which would be adequate for arthritic hands…or the male household sous chef. Enter French knife producer Therias Econome of Thiers, France. While trekking through the International Housewares Show, we cam upon their booth, and inquired about carbon steel knives. They had them, and better yet the handles were large and secure enough to work well for all of our needs. And, they are moderately priced compared to their forged or stamped stainless steel counterparts. We ordered a set for our own needs and have been extremely pleased with their performance and ease of use. Of course, there is the “rust” problem. Easily avoided if you clean the knives immediately after use with a soapy sponge, and rinse and dry with a dish towel. The riveted handles are unfinished beachwood which provides a secure grip, but also requires that they not be immersed in water for a long time. The result of acidic food contact may be a darkening or mottling of the blade…but who’s looking? The dishwasher is a no-no, but who puts their good knives in there anyway? The blades are stamped and heat treated XC75 carbon steel which has .75% carbon content vs .4 to .6% in stainless steel blades. Higher carbon enables a sharper edge and ease of sharpening, while a stamped blade is thinner and more flexible than forged blades. HIGHLY RECOMENDED.